I was gifted a well loved Craftman tool chest by a family friend. I'm planning to restore it to the best of my abilities, I have several of the drawers already stripped, rust removed, and painted. I'm moving on to the top cabinet now. There are several areas to strip before I can paint, but I don't want it to flash rust. Is there a paintable way to prevent flash surface rust on bare metal? And while I'm here, if any of y'all have restored a toolbox, did you strip and paint the interior of the cabinet? You can't see it with the drawers in, so I was thinking about just cleaning it really good and spraying with rust converter and leaving it like that. I'll still strip and repair the outside. Not sure what you mean by 'flash rust'? Yes, exposed raw metal can oxidize to an extent in a high humidity area. But if you clean it and then prime with a good metal primer immediately, then I wouldn't think it would be much of a problem. I've been stripping the paint chemically, then bathing it in rust dissolver (phosphoric acid base). As soon as I rinse off the rust dissolver it gets a layer of rust before I can even get it dried all the way to prime it. Would rinsing the rust dissolver off with mineral spirits help hold off the rust? First off, I would get a good dehumidifier running in the room that you are working in to drop the humidity level to slow down the flash rust. WD-40 is a good rust preventer that can be sprayed/wiped on as you are drying sections of the bare metal. Downside to WD-40 is you have to clean it back off before you paint. The below link is to a 'mega' penetrant/rust inhibitor that says it is safe/able to be painted directly over. Well, it looks like I was using the rust dissolver incorrectly. The instructions on the bottle say to rinse the work piece after treatment, so I was rinsing the pieces with the garden hose then trying to dry them before rusting - not working. I went to the product website and watched a video, they just wiped the piece down with a damp towel. So I stripped and rust treated a relatively flat panel, then wiped the product away. Several hours later, no rust! I sand the really tough converted rust off and prime it tomorrow. So yeah, better directions, or I need some more common sense! Lol. That makes a little more sense. It sounded like you were cleaning, by wire wheel, grinder, bead blast or what ever and getting the metal down to clean white. If left unpainted it will start to oxidize/rust again. The chemical treatment can be a good alternative. The phosphoric acid will convert rust to iron phosphate and then can be sanded/painted as you have done. 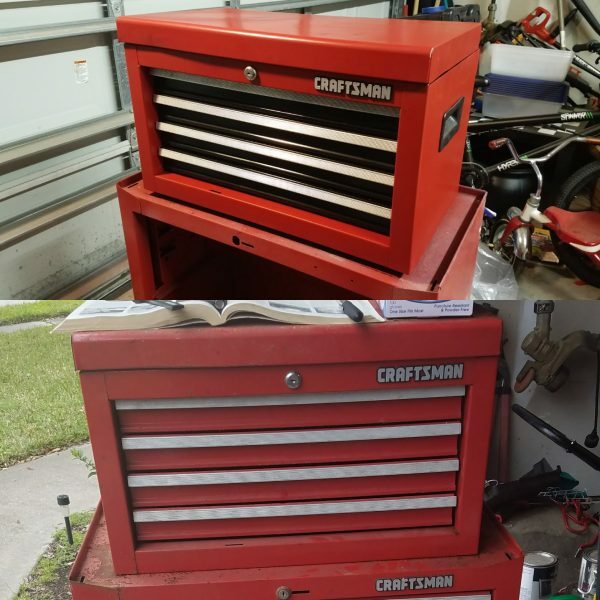 I finished the top box and figured I'd share a before and after with y'all. Thanks for the help! Kind of a blue green watery acid. It will change the actual surface to ferrous II Oxide. You can buy it at home stores and auto shops under names like Ospho 605. Wipe it on and let it sit then wash off. It stops on bodywork, it should work on a tool box. Sherwin Williams paint Co. has an Ospho type rust treatment but have no idea what all is in it? Since it's Ca., most likely 99% water! It would be mostly water. You don't want the acid too strong. It is kind of the same as bluing a weapon. If you have the acid too strong it will discolor the metal, great for a gun but not needed for a fender.